As a black college student in the rural West Virginia town of Selah Station, Kenia Dezy already feels out of place. But when an unexplained phenomenon starts transporting her back to pre-civil rights 1953, she finds herself woven into a tapestry of racial triumphs and tragedies. She begins to unravel secrets that powerful men would rather keep hidden, even if it means massacring an entire town through an industrial disaster. At the intersection of race, gender, class, and privilege, Kenia must navigate a community and a country wresting with its past, present, and future identities. ​Evolved Publishing presents Desert Rice by Angela Scott, a tale of 2 young people's desperate struggle to survive on their own in an adult world, as seen through the eyes of a 12-year-old girl. Young Adult/Contemporary 16+ (some mild adult situations). Samantha Jean Haggert is a beautiful twelve-year-old girl, but no one knows it. All they see is an awkward boy in a baseball cap and baggy pants. Sam's not thrilled with the idea of hiding her identity, but it's all part of her brother's plan to keep Sam safe from male attention and hidden from the law. 15-year-old Jacob will stop at nothing to protect his sister, including concealing the death of the one person who should have protected them in the first place--their mother. Sam and Jacob try to outrun their past by stealing the family car and traveling from West Virginia to Arizona, but the adult world proves mighty difficult to navigate, especially for two kids on their own. Trusting adults has never been an option; no adult has ever given them a good reason. But when Sam meets “Jesus” - who smells an awful lot like a horse - in the park, life takes a different turn. He saved her once, and may be willing to save Sam and her brother again, if only they admit what took place that fateful day in West Virginia. The problem? Sam doesn't remember, and Jacob isn't talking. When Don Carter flies to Santiago de Cuba, his plans are to rendezvous with his new connect, Vicente. He never expected to meet the beautiful and vestal virgin Maria - Vicente's daughter. It was love at first sight, Don and Maria unite romantically, the ultimate betrayal and disrespect to Vicente. A love child Mercedes is born. Risking it all for love, Don gives up everything and arranges for the two of them to be moved to New York City. Mercedes is the splitting image of her mother and Don does everything in his power to provide the same lifestyle Maria was provided in Cuba by Vicente. Mercedes lives the good life until old wounds are rehashed in the form of an informant. The Carter family is under attack as several members are murdered and secrets are exposed in the most vicious form. Will Mercedes find out who's behind all of the havoc before it's too late? Bodies have a canny way of finding Samantha Jean Haggert - the first, the dead body of her mama; the second, a naked man in the middle of the Arizona desert. For Sam, dealing with one dead body in her lifetime was more than unfair. Two is downright cruel. Seven years after running from West Virginia, Sam's now a young woman of 19, trying to put the pieces of her life together with the help of her family - Jacob, Boone, and Laura. But the naked man in the desert spirals her world out of control, resurrecting past hurts and revealing old secrets. It also pits against one another the two men who vie for her heart: Carson, her friend, her first kiss, and the one man who knows everything about her past and loves her despite it; and Turner, the stranger who knows nothing, but who excites and frustrates her all at once. When bad choices made as a child lead to more bad choices as a young adult, Sam finds herself at a crossroads, forced to face her demons head-on if she plans to have any future at all - with Carson, with Turner, or with anyone. But fixing the wrongs of the past takes time, and learning to forgive one's self is damn near impossible. 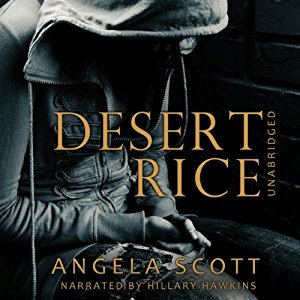 Visit old friends in this harrowing sequel to Desert Rice in which award-winning author Angela Scott brings back the characters so many listeners have loved. How YOU doin? Sending hugs & love ur way! Finally, a way to get your secrets unleashed! Secrets Unleashed Game is an audiobook of questions, dark and light, designed to stimulate dialogue and promote bonding between friends. Works best with 2 or 3 players but more are welcome. Created by Hillary Hawkins from Nickelodeon/Nick at Nite's Are You Afraid of the Dark ("Tale of the Jagged Sign") and Jade Mckenzie, "Stone" of Jaded The Musical. Talk, Play, Heal. How are you doing today? In need of some advice? Big Sister Advice Column is here for you. No matter what you're going through, boyfriend/girlfriend drama, fights with your parents, or problems with your friends, we want to help and we want you to be happy. This issue of Big Sister deals with How to Heal & Deal with Friends Who Don't Treat You Right. We've got 20 ideas! Try 'em all or pick just one. Let us know which one works best for you. Write in any time with your questions and your issues and we may just make one of them the topic of an upcoming issue. Big Sister Advice Column. Come to us. We're here for you. Big Sister Advice Column - The new go to place for children, teens, and young adults in need of some advice. Grown-ups can write in, too! We're here to help anyone who needs it and would love to hear from you! Created by Hillary Hawkins, known for her roles on Nickelodeon and her self-help books. Positive affirmations for children and teens can do a lot to assist them in developing healthy self-esteem. Affirmations can help instill good values, confidence, focus, and belief. Affirmations create positive attitudes, and enable children and teens to meet new challenges and achieve desired goals. Dream Builders: Affirmations for Children and Teens is the perfect addition for any library for parent and child to read together. The Affirmations in this book will change your life for the better with daily use. Your Word Is Your Wand gives you powerful, positive affirmations to speak over your life! Areas include: Success, Prosperity, Love, Marriage, Health, Protection, Guidance and more! It's time to speak the Divine Plan for our lives into existence. "For by your words you will be justified." Your Word Is Your Wand. Written by the late great Spiritual Teacher/Metaphysical Author Florence Scovel Shinn. Passionately narrated by Hillary Hawkins (2014 Voice Arts Award Nominee / Narrator for "Desert Rice," "31 Daily Affirmations Based On The Word of God: To Speak Over Your Life!," "How To Piss Off Depression," "If I Were Oprah Winfrey: Little Nia's Dream," and the "31 Bible Verses By Subject Series."